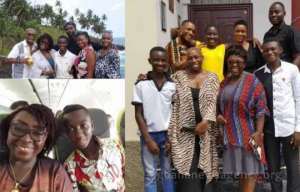 Master Quaku Praise, a student of Preventive Basic School in Aflao, who emerged the winner of the 2017 Godigbeza Quiz Competition, has returned from a trip to Sao Tome, as part of his prize package. The Competition organized by Values for Life (VFL-Ghana), an NGO in collaboration with the Aflao Traditional Council and Gallery GM was to mark the 20th anniversary celebration of Adzongagah Togbui Amenya Fiti V, Paramount Chief of Aflao Traditional Area. Master Quaku travelled to Sao Tome with a Former Deputy Minister of Tourism, Culture and Creative Arts, Ms Abla Dzifa Gomashie and Sarah Gusten-Marr, Founder of Gallery GM. The travel expenses were borne by Gallery GM, an NGO established by the internationally acclaimed artist, Gusten-Marr. Prior to the trip, the Former Deputy Minister, who is also, the CEO of VFL-Ghana, hosted the winners of the 2017 Godigbeza Quiz Competition in Accra for an educational tour. Whilst in Accra the young champions - Praise and Foster Bansah, had the opportunity to meet the Grammy Nominee Rocky Dawuni together with other distinguished personalities, who gave them words of advice. They also visited the Law Court Complex, Kwame Nkrumah Mausoleum, Art Center, National Theatre, Accra International Conference Center and the Parliament House. Ms Gomashie told the Ghana News Agency on their return that the trip was an opportunity given to young Praise to experience the world. She said the competition was the type of activity that helped to unearth brilliant kids in challenging communities and expressed the hope that Management of VFL-Ghana would be able to inspire them to want to achieve more. She said the competition was to increase the interest of the children in the environment and what goes on in their community. She said children should be prepared to unearth and unleash their creativity and they should learn from experts and resources person, who would be brought to Aflao to broaden their knowledge. Ms Gomashie said other activities to be undertaken this year includes skills development, reading clinic, poetry festival and a female legends night.